The recent Gallup survey shows that only 13% of the workforce worldwide are engaged in their work. That itself doesn’t include employees that are disengaged or partially engaged in their jobs. Employee engagement has a direct and measurable impact on productivity, team performance and financial results of the company. The more engaged your employees are, the higher chances your organization can prosper. People are your best assets. That’s the reason why you’re on this page. You are looking for an employee engagement speaker who has a profound knowledge on this subject, to help impact your current employees – helping them deliver their WOW service to the company (in-house) and their customers or clients. 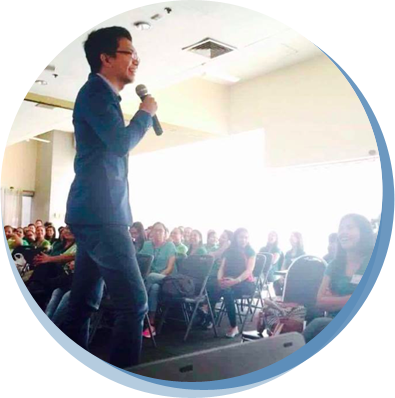 Venchito Tampon, a corporate speaker who conducts workshops on work-life balance, wave attitude values enhancement, and employee engagement workshops, can customize a training program for your team. The Leading for Employee Engagement program is based on survey findings of 10 million workers in 150 countries and designed by Kevin Kruse, a NY Times, Wall Street Journal, and USA Today bestseller, WE: How to Increase Performance and Profits Through Full Engagement, and also a leadership columnist for Forbes. Interested? We can customize an employee engagement workshop for your leaders and your team. Contact us below to request for a free training proposal.